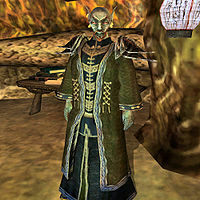 Rilvin Dral is a Dunmer mage and the current Archmagister of the Mainland House Telvanni, and therefore the head of the entire Great House Telvanni. He is also the highest level NPC in Tamriel Rebuilt. His Mouth is Malvas Relvani, who will at one point ask you to assist Dral in an experiment. He wears an extravagant robe, as well as a unique pair of Daedric pauldrons.